It’s an ambitious project to document the life of an international celebrity almost entirely in her own words. And that’s the task undertaken, not entirely successfully, by director Tom Volf in Maria by Callas. The life of the mid-century opera singer is captured primarily through taped interviews, diary entries, letters to friends (read by the opera singer Joyce DiDonato), and, of course, recordings of Callas’s phenomenal performances. We see the polished surface of a star born to humble beginnings in New York who rose to command stages across Europe and the Americas. It’s almost two hours of sweeping updos, elaborate costumes, chic evening wear, dripping jewels, swaddling furs, impeccable makeup, and pristine manicures. Volf tracks Callas’s career from the 50s through the 70s, and lingers on close ups of Callas’s arias. She’s a waif—all bouffant hair, expressive eyes, and bird-like bones. You wonder how such a big voice can possibly come from such a tiny frame. She’s magnetic. Passionate. Commanding. 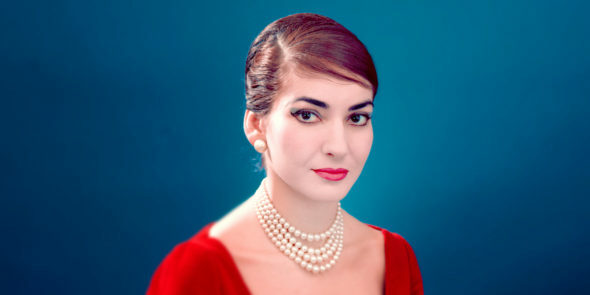 The singing is interspersed with autobiographical tidbits provided by Callas. But these are only sketches. Although she states again and again that she would give up her career to raise a family and it’s clear that at some point around her late 20s or early 30s she got married, the first time she utters her husband’s name in the documentary it’s to discuss their impending separation. We are left to wonder how genuine she is in saying that she’d give up her career for domestic life and how much she felt compelled to say that, given the prevailing gender norms of the years in which she was famous. Much of the autobiography portion is consumed with Callas’s operatic 10 plus year affair with Greek shipping magnate Aristotle Onassis, which occurred both before and after his marriage to Jackie Kennedy. Through interviews and letters you can see Callas’s attempt to put a positive spin on what must have been quite a tumultuous relationship. Even while he is pulling away from her, Callas writes to a friend, asking for agreement on how he has changed for the better. The final moments of the movie show Maria kicking back in Florida. Her hair is down for the first time. She’s wearing loose lounge wear instead of a corseted bodice. Her hair flows down her back, and she’s sporting thick glasses that magnify her myopic eyes. It’s clear how much effort has gone into the package of the public Callas persona. The contrast between the woman and the artifice would have been more effective with a bit more exposition. It’s an admirable goal to have Callas in control of her own narrative, but to do so leaves out information that would be helpful to provide context to this life. For example, Maria’s rivalry with an older sister who was considered to be the pretty one in the family. The scandalous headlines. The qualities of her vocal talents. The year Maria decided to lose some weight mid-career and lost nearly 80 pounds. How the weight loss may have contributed to her vocal decline. How her changing voice impacted her attempted late-career comeback. Without the biographical backstory, the documentary seems too surface level. If you don’t know a lot about Callas, do your research beforehand and come for the music and her arresting performances.